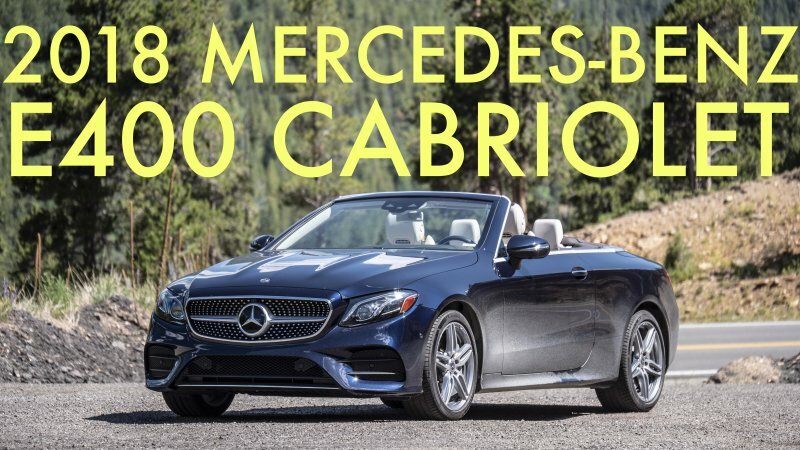 2018 Mercedes-Benz E400 Cabriolet Review | Who needs a roof? Welcome to Colorado and to the interior of the 2018 Mercedes-Benz E400 Cabriolet. We have the top down, the windows up, only so you can hear me, and I'm driving this car so you don't have to. It's a brutal job, but someone's gotta do it. Powering this gorgeous droptop is a twin-turbo 3.0-liter V6 that makes 329 horsepower and 354 pound feet of torque at sea level. Now if this engine was naturally aspirated, it would lose roughly 89 horsepower at the altitude that we're driving up to today, which is 9,000 feet, because of the thin air. Having the twin-turbo alleviates a lot of that power loss, and this E400 does not feel underpowered whatsoever. The transmission is a nine-speed automatic that shifts pretty seamlessly here in the mountains, which is a task that not a lot of transmissions are up to. As for the drive modes, you've got Sport, Sport plus and the default, which is Comfort. Sure, if you're driving the E-Series Coupe, put it in Sport, put it in Sport Plus. But with the Cabriolet, I want comfort all day. What are you guys doing tracking an E400 Cabriolet? Just drive it and enjoy that air suspension. As you can see right now, Mercedes knows how to do interiors right. As soon as I sit down, I feel like I'm in a rich person's car. I feel like I have money when I drive this, which is a good thing because the base of this car costs nearly $70,000. Looking around, I have every creature comfort imaginable and some that I couldn't even imagine. Heated seats, check. Cooled seats, check. Massaging seats, check. AIRSCARF, check. Wait, what the heck is an AIRSCARF, you ask? Well, we're driving with the top down, and even with the windows rolled up, it can get a little chilly, so we've got this vent right here underneath the headrest that blows hot air onto the back of my neck. Amazing. Another creature comfort I never would have thought of is the wind cap and the front spoiler. Both of these, yes, look ridiculous. But with the windows, wind cap and front spoiler all up, you get all the feel of a convertible with nearly none of the wind. It's a relatively quiet car too, even with the top down. Except for when you're driving through tunnels like this one underneath one of the mountains, but there's nothing Mercedes can do about that. Much better. All these interior materials, which are almost all upgrades, feel great to the touch, as expected. The gauges looks great and are easy to read, even in direct sunlight, and the 12.3-inch touchscreen is massive. It is 2018, so it comes with both Apple CarPlay and Android Auto, speaking of which, am I the only one hoping for a significant upgrade soon? We gave Apple CarPlay our Tech of the Year award in 2016, and it feels like it hasn't changed much since. Anyways. The materials inside are almost as fantastic as their names. We have Macchiato Beige and Espresso Brown Nappa leather, as well as Magnolia Flowing Lines wood. The headliner is also Macchiato Beige, which reminds me, I never got my coffee this morning. The base price of this car is $68,800 before destination. You might be thinking to yourself, "Chris, that car looks, sounds and drives wonderfully, all for under $70,000. That's fantastic," and it is fantastic or at least it would be if the car that I am currently sitting in did cost that much. This E400 is equipped with options like Lunar Blue Metallic paint, Macchiato Beige and Espresso Brown Nappa leather, Magnolia Flowing Lines wood, 19-inch AMG wheels, illuminated door sills, massaging, heated and ventilated front seats, air suspension, soft close doors, the Premium Three package that includes a ton of options including surround sound and an entire driving assist package and active park assist, and the AMG-line styling package. You take all of that, plus tack on $995 for destination and delivery, and you get a convertible that is just a few lattes shy of $90,000. Would I get this car over its roofed brother? As a fair-skin ginger living in the mountains of Colorado, probably not, but I totally get the appeal. Driving around the mountains in the summer with the roof down and the sunscreen applied is more than comfortable. It is a daydream bordering on fantasy. Albeit a $90,000 one. There are currently no comments for 2018 Mercedes-Benz E400 Cabriolet Review | Who needs a roof? Driving this convertible in the mountains is a dream, but it’ll cost you.